We like to build knives hoping people will use them “with vigor”. Meaning we don’t like it when our knives are babied and left sitting on display. As beautiful as they are, they are most attractive when working. With some basic guidelines and occasional TLC your knife will last a lifetime and beyond. Never wash your knife in a dishwasher. Rule #2 - see rule #1. The high heat and multiple sprayers in a dishwasher make the materials of your knife move all out of wack against each other as different materials expand and contrast at different rates with different and varying temperatures, this is mainly bad for the handle construction. Washing in a dishwasher doesn’t do your edge retention any favors either as everything is all jangling around in there all knocking around banging into all kinds of things that you would never consider cutting agains in normal use. Rule #3 - Don’t let anyone put your knife in a dishwasher when you aren’t around. People putting other peoples’ knives in dishwashers is probably the reason voodoo dolls were invented. Use regular dishwashing soap and a sponge or slightly abrasive scouring pad and wash by hand. Don’t put in a soapy sink with a bunch of other items, it’s not only dangerous but the edge can get damaged in the process, prolonged soaking also isn’t great for the handle. Those magnetic strips are great for storing knives as it allows them to dry completely and keeps the edge away from anything that could dull it. Those wood blocks are ok too, drawers are the worst. We provide a kydex sheath for every knife in case you do want to store it in a drawer you can use it to protect the edge. The amount you will have to sharpen your knife depends on how often, and how, you use it as well as what kind of cutting board you are using (wood or plastic only please). Regarding the difference between Carbon and Stainless - in a nutshell: Carbon is softer, which allows you to get a wicked edge more easily - but takes more maintenance overall. 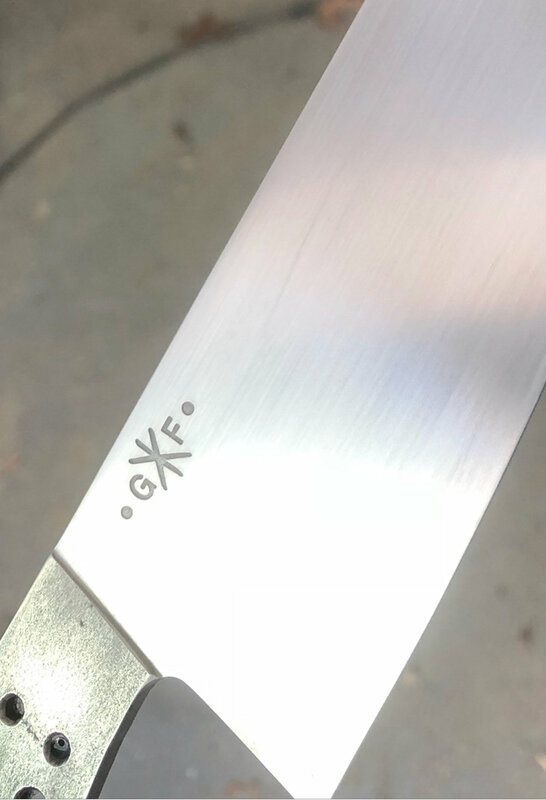 Stainless Steel is harder, bit more elbow grease to get an great edge, but it does then tend to stay sharper for longer. Using a steel, or ‘honing’, isn’t a method of sharpening but is a way to keep your edge true. Those diamond steels you see actually take metal off of the edge and create micro-serrations which is in fact a quick sharpen, but with honing you don’t want to take metal off of the edge - you just want to push it back in place. Use a ceramic or traditional steel to keep your edge in shape in between sharpening sessions. If you would like to sharpen your own knives by hand, we suggest using wet stones and defer to fellow knife maker Bob Kramer who provides wet stone sharpening instruction as excellent as they can get. There are a lot of knife aficionados out there these days who provide both sharpening instruction and hand sharpening services, search for one close to you. If you take your knife to a hardware store or something like that where they offer knife sharpening they will basically re-establish the whole edge of your knife, but they grind off a lot of metal in the process. So you can get a great edge but the profile of your knife will change much more quickly. There are also many services which are mobile and will come right to your door, just be sure to ask what method of sharpening they offer and if they do offer hand sharpening pay the up-charge for it. If they don’t, ask them to be gentle. Using a counter top electric sharpener is generally unadvised on your custom knives, if you do prefer to use these go as high end as you can get and choose one with a ‘step’ system that finishes your knife with a fine a grit as possible. As with the above, these really put the grind onto your edge and leave it with a sharp but ‘rough’ edge. Great for axes. Above all else, keep your carbon steel knife dry between uses. The nature of the steel which allows for a superior cutting edge is also quite corrosion prone. For real, if you leave your knife with a few droplets of water on it after doing the dishes there will be rust on your blade by morning. But don’t fear! You haven’t done any real damage yet, just scrub it off with a scouring pad and/or abrasive powder. For bigger jobs you may want to keep a rust eraser handy. If your knife spends long stretches in a drawer between uses we suggest oiling it lightly with something like Tsubaki Oil. Corrosion is not to be confused with the development of “patina” (pictured above), which to some is part of the joy of using and maintaining a carbon steel knife as it tells the story of how you use it. The steel will darken in spots (especially with acidic foods) and form a kind of blotchy and ‘antiqued’ appearance - some people even force this look along, think if it like breaking in a new leather jacket. There is no choice about whether you want a patina on your carbon steel knife or not, a patina will develop regardless of your desire. There is evidence that the patina also helps protect the knife from corrosion but don’t count on it and keep your knife clean and dry at all times. *same rules apply for damascus, although the patina won’t be as evident due to the etching process to expose the different metals. They don’t call it “StainNEVER Steel” for a reason! Keep it clean and dry just like a carbon steel knife or it will indeed rust, just not nearly as quickly.